Stepping through the sliding door of Kristen Bor’s custom 2016 Mercedes-Benz Sprinter van, visitors duck under a rainbow of Tibetan prayer flags. Bor brought them back from the Mt. Everest base camp last fall. Blessed by a Nepalese lama, the color of each flag represents a different element: air, water, earth, fire. “When they’re waving in the wind, it sends good vibes into the universe,” Bor said. Bor wants to spread good vibes of her own. A former Washington, D.C., environmental policy advocate turned travel blogger, she now lives the van life, traversing the country in her Sprinter. Her site, Bearfoot Theory, encourages people to enjoy the outdoors and offers guided tours designed for all experience levels. Last month, Bor captained a hiking tour through the public parks of southern Utah. In August, she embarks on a 10-day backpacking trip through Lake Clark National Park in Alaska. This summer she will spend weeks exploring Idaho’s parks for its state tourism board. “I wanted to make sure that the values of environmental management and conservation were part of what I do,” she said. The van helps make it possible. Bor purchased the Sprinter 4×4 2500 in 2015, drawn by its reputation for reliability and ample interior space. Then she set about turning it into a home. A customization shop started by installing a couch along the driver’s side wall that seats up to four people, or folds out into a queen-sized memory foam bed. It also serves as seating for a work space when she screws an adjacent desk into removable floor panels. The “kitchen” space includes a sink and galley, a two-burner gas stove and a refrigerator. Doors on the opposite wall open to reveal an enclosed shower. Glossy white walls and reclaimed wood cabinets lend a modern, stylish aesthetic. Bor lives in the van full time, so having it adapt to instantly be used as an office or her home was important, she said. Ambient LED lighting bathes the van in a warm, soothing glow. “It makes it feel like home,” she said. Bor paid extra for the 4×4 powertrain and its added capability in off-road situations — $7,495 is the current price for the option. 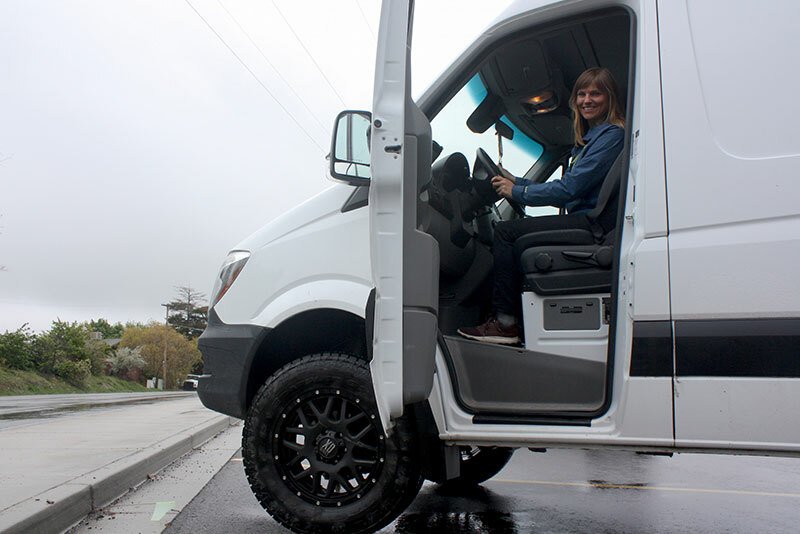 Her Sprinter also is outfitted with XD wheels and all-terrain tires to increase its ruggedness. She also ordered a matte black ladder, roof rack and rear storage box from Aluminess Products Inc. in Santee, Calif. Combined with the extra 4 inches of ride height on four-wheel-drive models, Bor’s van sports an extra-aggressive look that stands out in the snow. The theme of conservation is ever-present: The sink faucet uses an efficient, directable stream; the shower head has an on-off switch for rinsing gear outside; the floor of the shower tilts up to drain into a greywater tank; and 180-watt solar panels on the roof provide enough power to keep Bor’s work equipment charged and ready. Another 120-watt portable panel can unfold and be placed outside in sunny weather to power the van. “I can still be getting juice to my batteries, even if I’m parked in the shade,” Bor said. On an April drive through steady snowfall in Big Cottonwood Canyon just outside Salt Lake City, Bor activated four-wheel drive and pointed out the places she skied over the winter. Several feet of dense snow covers the ground, and her boyfriend is an instructor at a nearby resort — her season is far from over. With the Sprinter, she can drive to the day’s best conditions, compose a blog post or fire off a note to her web designers and then settle down for the night in privacy. There’s even a removable port-a-potty inside the shower, so she never has to leave the van. “I wanted to be able to shut in here and have no one know I was by myself,” Bor said. But in the world of social media, she’s far from hiding. Bor started the Instagram account @SprinterCamperVans, where she posts photos of custom Sprinter builds of all types. The account now boasts more than 18,000 followers. It’s one of the most prominent voices that has accelerated the growing passion for Sprinter vans online. “It’s been a really cool way to connect with the community,” she said. Living out of the van full time has its troubles. Bor has had particular issues, like leaky pipes threatening her fuse box, solar controller and 2,000-watt inverter under the couch. It comes with the territory of living in a vehicle, Bor said. Many of the problems have been well-documented on her blog to help others plan ahead. In the end, the journey that’s taken her from congressional offices to the national parks of the American West has been exactly what she had hoped. “The fact that I can go out and ski on a Wednesday or go on a midweek backpacking trip makes it all worth it,” she said. Great article! We appreciate the video shots of Kristen’s Sprinter with our Aluminess gear!